Don’t let your naked logs suffer from indecent exposure! 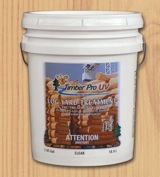 Timber Pro Log Yard Treatment is a natural oil waterborne coating with unique UV absorbing package for the treatment of logs in the process of drying or awaiting final construction. moisture loss in the logs during the drying process. The coating helps reduce unwanted discoloration associated with fungal and mold growth on the surface. Excellent Penetration: Due to its unique formula the Log Yard Treatment penetrates deep into the wood to provide an excellent bond. Breathable: Especially important on green logs while they dry out. 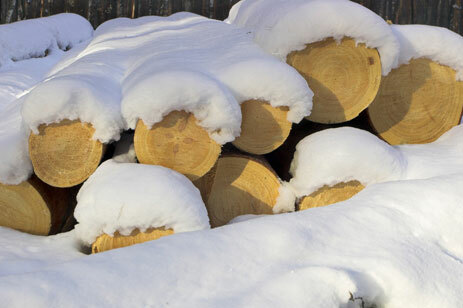 Good UV Protection: Unique UV absorbers protect the logs from the sun's damaging ultraviolet rays. formulated to adhere in these conditions. Easy to Apply: Log Yard Treatment formula can easily be applied by spray, brush or paint pad. 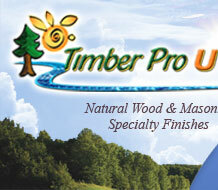 Easy to Apply Finish Coating: Is compatible with all Timber Pro Products.